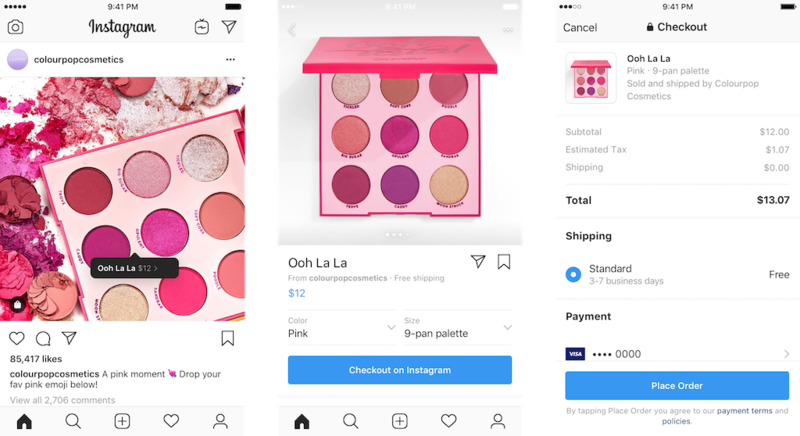 Last month, Instagram announced the launch of Checkout, a new feature that will allow users to check out products from brands from within the app and even make purchases without ever having to leave the app. The feature works quite smoothly on the limited number of accounts that it is now available on. For instance, if you visit the @NikeTraining Instagram page now, you will find a number of posts with a ‘shopping bag’ icon. These are posts with products that you can purchase. Hitting any one of these posts will take you to the image with a ‘Tap to view products’ message. You may pick the product you like, and then also customize your purchase based on size, color, etc. and make the purchase. Instagram users outside the US are now displayed a ‘Visit Website’ option instead to make purchases directly from the brand’s website. From a business perspective, this is a huge step for Instagram as it builds a sustainable business model around its current visual social networking platform. The potential is huge. Instagram could, in theory, open this feature to everyone, and this could make way for influencers to make affiliate commissions for products they refer on the app. Today, Instagram does not have a way to monetize the huge influencer marketing ecosystem, which will change with this new feature. So what does all this mean for the eCommerce ecosystem at large? Although the feature is in closed-beta right now, we expect the Checkout feature to be available to all businesses in the next six to twelve months. When that does happen, we are likely to see a huge churn in the way eCommerce businesses operate. Think of the small-time retailer selling fashion accessories online. Today, most of them have a store on eCommerce platforms like Magento or BigCommerce. Customer acquisition is a huge pain given that most buyers head to Amazon online. Given that Search engine is no longer a viable channel for these small time stores, most of them head to social media to attract eyeballs to their stores. Alternately, most of these small time stores who do not sell products that is a good fit for social media (think auto spare parts) choose to list themselves on Amazon instead. After all, if Amazon outranks your website on Google for every conceivable query, it is a good idea to join them rather than fight them. But with Instagram Checkout in place, store owners no longer have an incentive to run their own store. They may, as well, list their products on Amazon, Facebook (which already has a Store feature), Instagram and every other customer acquisition channel and monetize directly instead of having to bring customers to their website and then translating them into sales. Selling on Instagram has lesser friction than acquiring traffic from this channel and converting on the site. That does not mean stores will not have a website presence at all. Instead, most store owners might choose to use websites purely for marketing purposes like content marketing or to build a mailing list. Spending on a store may seem like an unnecessary expense. That could however not be the case if the various stakeholders in the ecosystem adapt suitably. Should Instagram charge users a monthly fee based on the number of products they have listed, that could make the platform less attractive to sellers. At the same time, should platforms like BigCommerce move away from a subscription model to a model based purely on processing fee, it increases the likelihood for sellers to continue selling on these web platforms while using Instagram as an alternative source. After all, selling on your own store gives you a level of control that would never be possible over third party platforms like Instagram or Facebook. But from a buyers’ perspective, Instagram Checkout is more user-friendly. Imagine coming across a new seller you want to buy from. If you were to land on their website, you will be required to go through the entire checkout process like entering your billing and shipping details manually each time. With Instagram, all this is a one-time process. You may buy from new stores with just a click of a button without any of the checkout hassles. In some ways then, Instagram Checkout could do to eCommerce stores what Reddit did to message boards – why sign up on new boards each time you had a question when you could simply ask the same question on the relevant subreddit? It will be interesting to see how eCommerce platforms like Shopify, BigCommerce and WooCommerce change their models to take on the new eCommerce platform in town. Will this mean an end to a subscription model? Will that mean a fundamental shift in the way customers buy?